I just found out that the first has been in the previous year in Brussels. The special offer price for WSET diploma holders still was at 149 Euro and in combination with ¿?¿?¿ that didn’t sound tempting, at first. Faye, Marc and Jens had put up. Fortunately it was in Munich and so I went to experience two full days of getting fantastic seminars on many different subjects about the business of wine, how innovative one can start his own business in wine and meet interesting people from all parts of the industry. That really was great and worth every second but the best of all at that event was, especially for me, caught in a German business behaviour, the experience of how open everyone shared their ideas and even business models. 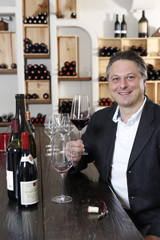 so did Marc Clemens, founder of „Sommelier Prive“. In this exact spirit, all two days went on and experts in their field shared most interesting insights in what looked like niches in the wine market, but isn’t that how that fruit computer guy once started? I can not report about the content of all the seminars given, reaching a span from crowdsourcing, bloggers and their influence, branding, wine clubs, consumer treatment, marketing aspects of brand and place, new packaging, the Chinese market, consumer interaction and many more. But actually, it wouldn’t even make any sense if I did so. As this event is all about sharing, the programme and sessions still can be found at http://wbis.eu/programme. Well, so what ? Right, so what if you also can see all the presenters, get their bio and background, and can look at every single presentation at „Slideshare“ ? Well, then you see what sharing ideas is all about and WBISs core competence is connecting sharing people. Another point at the programme was the #WBIS Business Award. Eight start ups presented their business and were judged. The winner was André Ribeirinhos „Smart wine Glass“, a fantastic idea and a win win solution, giving the consumer a total review of all wines he tasted during an event and the exhibitor the contact of the visitor who liked his wine. If that, as I do hope, becomes a standard on all wine events, I will save tons of paper and time! Great Job !! „Smart Wine Glass“ at http://wbis.eu/wbis-business-award/. If you should want to know, who participated at the event, well as you probably guessed, you can find the list at http://wbis.eu/participants/. Besides the two seminar rooms where sessions were held simultaneously, making it hard to decide which one to miss, there were fully catered coffee and lunch breaks and a full dinner at the Augustiner on Saturday evening. The relaxed atmosphere, great seminars with so much content, great people, being fully taken care of from A to Z, in short the entire WBIS 2014 in Munich to me was an outstanding event and an absolute success. Having said this, yes it absolutely is worth the money, and yes, I am looking forward to the WBIS 2015, wherever it may be. Finally, if you think of opening a new business in the wine industry, consider talking to some of the speakers of this event.